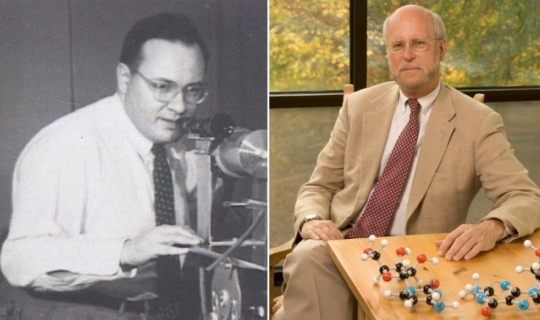 Nobel laureate Dr. Arthur Leonard Schawlow (left) and likely future Nobel laureate Dr. Henry F. Schaefer, III (right). Once again, there has been a long pause in blog entries because I am working hard to finish my new high school chemistry course so it will be ready for those who want to use it during the upcoming academic year. I just finished the rough draft of the course, and my reviewers are running ahead of schedule. Thus, it looks like the course will be ready on time. I truly hope it meets the needs of homeschoolers who want a college-preparatory, scientifically-sound, and homeschool-friendly general chemistry course. Even if you aren’t in need of a high school chemistry course, you might be interested in the way that I start and end my text, because it involves the views of two people who know more about science than I ever will know. I start with Dr. Arthur Leonard Schawlow, who shared the 1981 Nobel Prize in Physics with Nicolaas Bloembergen and Kai Siegbahn for his work on laser spectroscopy. In addition to that high honor, Dr. Schawlow was awarded the National Medal of Science, the Stuart Ballantine Medal, the Young Medal and Prize, and the Frederic Ives Medal. As a fitting tribute to him, the American Physical Society established the Arthur L. Schawlow Prize in Laser Science. But the context of religion is a great background for doing science. In the words of Psalm 19, “The heavens declare the glory of God and the firmament showeth his handiwork.” Thus scientific research is a worshipful act, in that it reveals more of the wonders of God’s creation. I strongly agree with Dr. Schawlow. Using science to study God’s creation is what led me to believe in Him, and every time I learn something new about His creation, I am filled with awe and wonder. I use Dr. Schawlow’s quote in the introduction to my chemistry book to let students know that science is more than just an academic exercise. It is a way to come to a deeper appreciation of God’s majesty and power. The significance and joy in my science comes in those occasional moments of discovering something new and saying to myself, “So that’s how God did it.” My goal is to understand a little corner of God’s plan. I don’t think anyone has described the goal of science more accurately! 1. Cosmos, Bios, Theos, Henry Margenau and Roy Abraham Varghese, ed., Open Court Publishing 1992, p. 106. I think confusing the latter with the former for many of these phenomena (also called the “God of the gaps” fallacy) is the reason why God has such a bad reputation in the eyes of many. BTW, Dr. Wile, what do you think of the nebular hypothesis ? The choice between (A) and (B) is an important question for each situation, Rezo, and I think it is one of the many choices that scientists must make. In general, if there is a mechanistic explanation for a phenomenon, then (B) is the most likely option. If there is not, then (A) is at least a possibility, and a good scientist must be open to that. In addition, there are theories that specifically include (A), such as Humphreys’s theory of planetary magnetic fields. If such theories can be used to make predictions that are confirmed by the data (as is the case with Humphreys’s model), that means (A) has even more merit as an option. I honestly don’t think that choice is “the reason why God has such a bad reputation in the eyes of many.” God has a bad reputation in many people’s eyes because they don’t want to accept His existence. As a result, they rage against Him. Such people exclude (A) as an option, for no valid scientific reason. As it currently stands, the nebular hypothesis doesn’t work. If there is a mechanistic explanation for the formation of the solar system, it hasn’t been found yet. Thus, (A) remains an option. At the same time, however, that doesn’t mean (A) is the only option. The answer could be (B), but we have no idea how it might have happened. Dr. Wile, thank you for the response. There was one person who pointed this article to me. Is it correct or misleading, what do you think ? I think the article is heavily over-interpreted. What the astronomers found was a region in which a massive body was attracting a lot of dust towards it. That’s not surprising. Gravity causes that to happen. To say that this is the “birth of a star” is quite a stretch. We have no idea whether this will form a star. All we know is that it is making a massive body more massive. Probably. And to consider that I haven’t found this article in a “serious” science website is pretty surprising. In other words, natural processes and operations are not themselves instances of God’s creative activity; rather, they show his Providence at work in maintaining his prior work of creation, which is presupposed by the way these processes and operations now take place. According to some sages, God did not create the universe once, He is constantly recreating it. See it this way it seems to me that everything is the result of His direct action. Little off topic….but another one. Thanks for the link, Matt. I plan to read the scientific paper and blog about that as soon as I can. Thanks for those links, SJ! I notice that he is calling for carbon-14 testing of these soft tissues. I think it’s telling that no one is doing those tests. I recently found out that the group who gave the 2012 talk on C-14 in dinosaur bones that was later stricken from the proceedings (http://creation.com/c14-dinos) is going to present two posters at an AOGS-AGU conference this summer in Singapore. It’ll be interesting to see what the reaction is this year, given this dinosaur blood paper. Thanks for this quote. The farther along I get in my studies of the natural world (I’m a third year doctoral student in chem) the more apparent the power and might of God become to me. Thank you so much, Mary! That really made my day!